Facebook has broken through the 200 million users barrier. 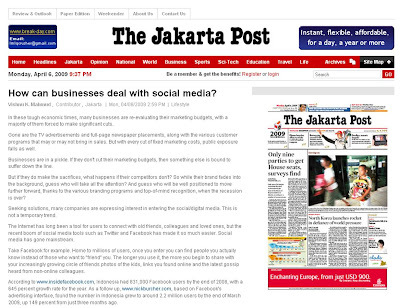 Comscore have reported on Facebook's European dominance and a wide range of publishers have commented on Facebook's latest user numbers - including the Jakarta Post in Indonesia with an article that feature some of my comments (here). I think it's most interesting to look at where Facebook hasn't taken off. There are a number of stories in the bottom 30 countries by Facebook use against proportion of population. Clearly, in some cases there are massive populations with limited internet access, but in others Facebook has not been able to topple a local / established player. In Eastern Europe local market players like Nasza Klasa and V Kontahkte dominate. 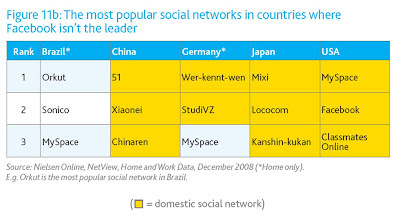 In Holland Facebook has around 10% of the users that Hyves has, in South Korea CyWorld is still the market leader and in Brazil, the most socially active (online) country in the world, Facebook has a tiny market share compared to the dominance of Orkut. Clearly Facebook dominates internet use of a number of countries whilst others have significant growth potential. Also worth remembering that whilst 200m is a huge number, in aggregate it still only covers around 3.5% of the 5,741,544,589 total population represented by the 98 countries that Facebook reports statistics for! Therefore lots of room for further Facebook growth and looking at the speed with which Facebook use is growing in Asia (particularly Malaysia and Indonesia) could this region become even more important for Facebook than the US and Europe? When these figures were done Macedonia was at position 42 with 164,240 Facebook users, which according to Wikipedia represents 8.02% of population. Macedonia is therefore neither in the top 30 or bottom 30 by usage. Nick, there's 98 countries being referenced yet the bottom 30 only goes to 95. What happened to 96-98? Do they have zewro usage, or have they been missed out for some reason? Great data, could you instruct me how to find the number of Facebook users for a particular country? I am especially curious about the number of facebook users in Tanzania. Thanks for any help or instruction! Does the Facebook advertising interface really tell that it has "less than 20 users" in Estonia? Because there must be at least hundreds, my somewhat educated guess would be possibly a few thousand, even I myself do have more than 70 FB friends from Estonia. maybe people just aren't keen enough to fill their profiles? The Estonia network in FB has over 22 000 members. Facebook figures have been updated since this post. They are now saying that Estonia has 56,360 active users. The figures also now state that there are 33,040 Facebook users in Latvia + 52,000 Facebook users in Iraq. I will be publishing the latest Facebook usage figures by country shortly - so please come back soon if you want to find out the current state of Facebook usage by country. Where is number 27 in your top 30? You seem to go from 26 to 28! hi nick, how many user in Malaysia? It would be interesting to know what the statistics will be by nationality rather than country penetration. There is a very low penetration for the Philippines, but many of my Filipino friends are actually scattered all over the globe. This is because Russia and Brazil have their own versions of facebook.